In this three part series we’re going to go through a worked example for me to create a bot for my website: thoughtstuff.co.uk. In Part 1 we created a knowledge base of questions which users can ask. In Part 2 we created the bot to take those questions and return answers. In Part 3 we’ll configure the bot to show alongside webpage results. And how does this look to people searching for you, or your business? I think this is a really interesting and exciting step in the world of search. 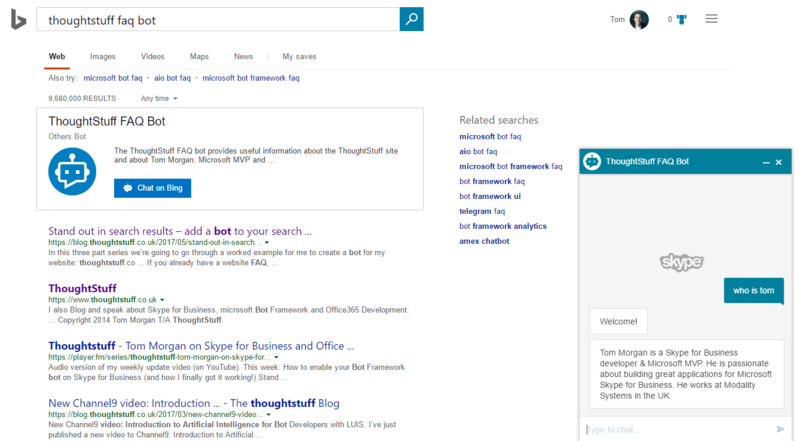 For years our search results page has essentially been the same – a list of blue links surrounded by adverts. Bots and AI really have the potential to change this status quo and mix it up. I can use the “big hammer” of generic web search to find the company I want to talk now, and then use the refined bot for that company to ask my specific question and get answers quickly. By doing this I am going to get better answers: the dedicated bot for a specific company will always do a better job of answering those domain-specific questions. So, what do you need to do if you want to add a bot to your search results? Step 1 – Write a bot. Watch my Channel9 video Getting started with bot development using Microsoft Bot Framework and read my blog. Step 2 – Read part 1 and part 2 of this series to fully understand what’s happening here. Or, if you’d rather have someone like me do all that for you – talk to my employer about it. Bots are here and they’re taking on search. Are you ready?